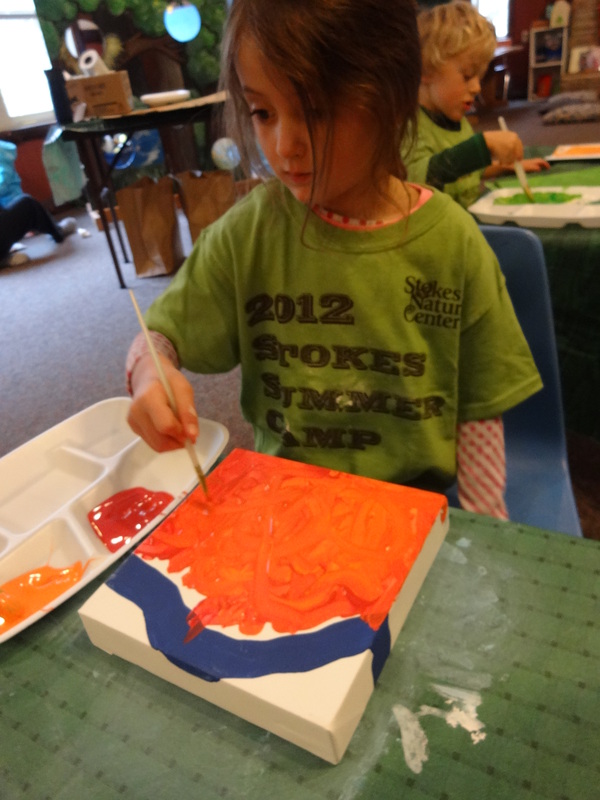 A lesson in seeing color in Nature’s seasons, and painting with an analogous color scheme. I introduced the lesson by showing the children images of nature in the different seasons, focusing on the different colors present. They pointed out which color was dominant by squinting their eyes to look at the image. I then mixed the color wheel from the primary colors red, yellow, and blue, and we introduced the analogous colors…red/orange, red/purple, yellow/green, yellow/orange, blue/purple, blue/green. We had nine preschool age children, but you could do this project with as little as four. First, make sure to number the back of the canvases and place students names on the back. 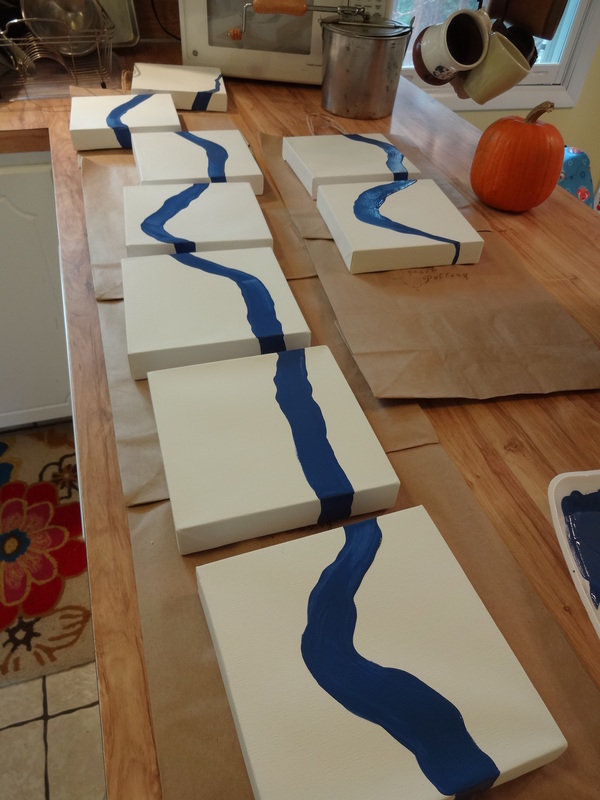 Using Acrylics, paint your “river” connecting all the primed canvases, including wrapping over the edges of the canvas. Note: The reason to strictly stick with analogous colors is that many young painters mix the paints so much that they muddy the colors. Using analogous colors prevents the completely brown canvas! It’s also a great new vocab word and way to review the color wheel. 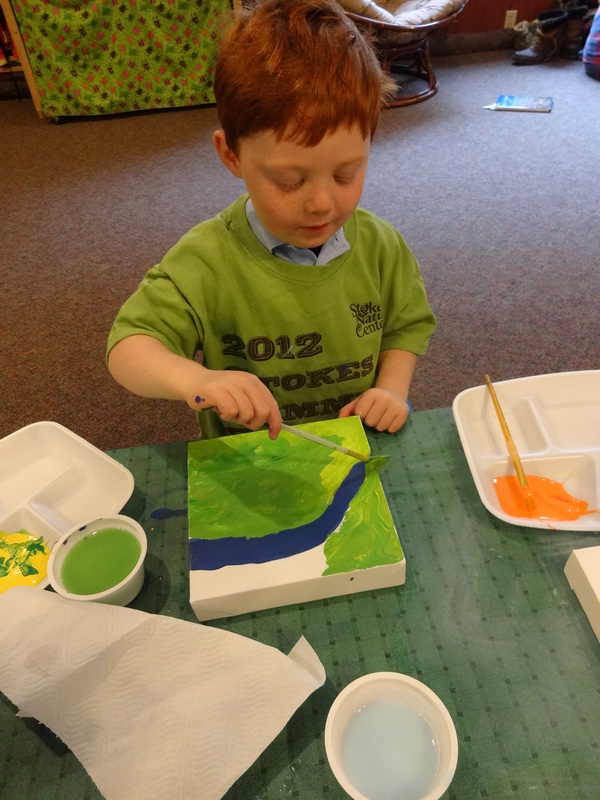 You will need to let all the students canvases dry and then touch up the blue river threading through the canvases. Display as a complete collaborative piece. I like to have each student sign their canvas where it is visible to the viewer. Later in the year, you could add collage images of the flora and fauna found in the local watershed. This would help stretch resources as canvases can be pricey!